To be more specific, this is about the conspicuously high decay resistance of small fractions of cortex tissue often but not always found in Aglaophyton and Ventarura , the most common and the rarest land plant preserved in the Early Devonian Rhynie chert. For an introduction it is mentioned here that the xylem of the central strand is a comparatively "hard" tissue, judging from its narrow cells and the fact that it is usually seen in good shape even when other parts of the plant are in a queezed or decayed state. Most of the cross-section, which is the area between the epidermis and the phloem around the xylem, is made up of a tissue called cortex . 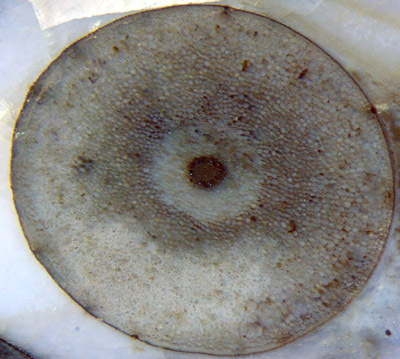 Fig.1 (right): Aglaophyton cross-section, 4mm, with dark xylem, concentric lighter phloem, epidermis, and cortex as the largest part in between. 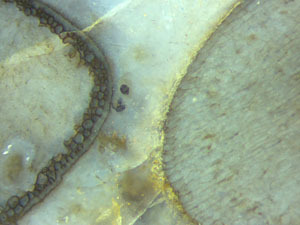 Fig.2 (left): Aglaophyton as a hollow straw, with xylem strand and fungus vesicles inside, early silica gel and microbial coatings outside, and a ring of well-preserved cells. The cortex serves more than one purpose: providing a place for photosynthesis, stuffing the tube and keeping it in shape, and fixing the central strand in the centre. All this can be achieved with a smaller amount of cortex, judging from live plants with large voids in the cortex. Possibly the plant can do with even less cortex, as a (partially) hollow straw. 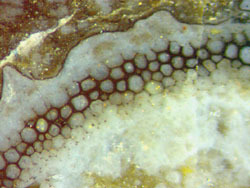 Hollow straws of Aglaophyton, seen in cross-section as a ring of surprisingly well preserved cells, are not rare (Figs.2-4). The existence of a cylindrical lining involving well-preserved cortex cells while the bulk of the cortex has completely vanished gave rise to wonder. The proposed explanation as a result of quick silicification of only a few peripheral layers of cells [2,3] by moving "silicification fronts" has been doubted for various reasons (as by A. Channing ). It seems to be disproved by Fig.3, where Aglaophyton sections with different aspect are seen close together and hence had been subjected to the same silicification conditions. Fig.3 (left): Aglaophyton sections with strongly differing aspect. Obviously something else than silicification fronts is required here for an explanation. The possibly complex processes producing the phenomenon may formally be reduced to something simple: It was not silicification but decay resistance of the peripheral layers which came first. It would be interesting to know whether or not the plant went on living as a hollow straw for a while with the bulk of the cortex being more or less destroyed. A particular search for related evidence has not yet been done. 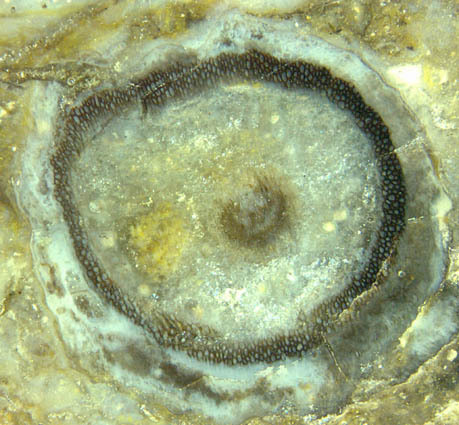 Fig.4 (right): Aglaophyton, cortex decayed except for a layer of well-preserved cells along the periphery, with a dome-shaped extension of the decay-resistant layer covering a spot of damage. Width of the dome 2mm. There is evidence that the persistent tube is not brought about simply by providing some anti-rot agent to a peripheral layer of cells. Fig.4 shows that a more complex process must have been involved: It is seen that the plant has managed to form a dome-shaped decay-resistant cover above a spot of local damage. What makes the sections of hollow straws of Aglaophyton (as in Figs.2-4) still more conspicuous is a black stain or deposit often but not always seen on the cell walls, which makes the straws stand out starkly against the pale plant debris in the chert. So it appears that in addition to a decay-resistant lining consisting of tissue, there is a lining on smaller scale, consisting of a deposit on decay-resistant cell walls. The phenomenon of highly selective preservation amidst general decay has become even more enigmatic with the discovery of Ventarura, whose cross-sections are often but not always conspicuous for a concentric ring of similar aspect as the rings in Figs.2-4 but with the distinction that it is placed somewhere within the cortex, most often well away from the (usually decayed) epidermis (Fig.5). 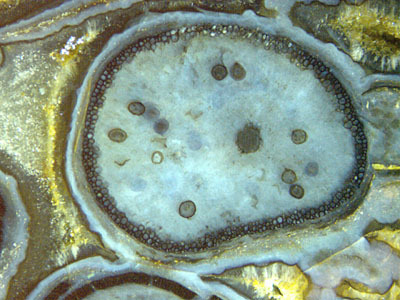 Fig.5: Ventarura cross-section, 7mm, with a ring consisting of well-preserved cortex cells while the epidermis and the cortex within and without the ring are completely decayed. Similar as with Aglaophyton, good preservation and dark aspect are not coupled here. If not dark, the well-preserved fraction of the cortex is easily overlooked, in which case the plant fragment may not be recognized as Ventarura at first sight. Cell walls with and without black stain can be present in the same ring and even in the same cell, as seen in Fig.6. Fig.6 (right): Ventarura cross-section, detail. Note the cells with or without dark lining, also both with and without dark lining on parts of the cell wall, and walls which do not seem to make a closed cell anymore. Apparently the claim in  that the cells with thick-walled aspect are sclerenchymatic can be refuted by the evidence presented here. This is also confirmed by Fig.7 where it is seen that the black lining can break off in flakes and hence most probably is not an intrinsic component of the cell wall but a deposit. Where the ring had lost its dark aspect by such subsequent process whose nature is likewise unknown as that of the deposition, the original thin cell walls have reappeared, well seen with suitable illumination but less so in Fig.7, with a few black splinters of the deposit still sticking to them. By the way, Fig.7 also shows that Ventarura can easily be mistaken for Aglaophyton if the rot-resistant layer is found close to the outer boundary after the cortex has decayed and vanished there. In this connection it may be mentioned that, the other way round, Aglaophyton occasionally had been mistaken for Ventarura. 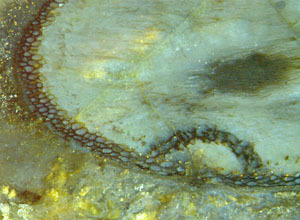 Fig.7 (right): Ventarura, detail of inclined section, well-preserved ring of cells with dark deposit on the walls, flaked off locally. at the periphery of Aglaophyton and regularly in Ventarura. (2) The decay-resistant tissue can favour or induce a deposition process in the dead plant, making the cell walls appear dark and strong. (3) The tissue with coated cell walls in Ventarura has been mistaken for sclerenchyma. (4) The similar aspect of the persistent tissue in the two non-related plants suggests similar formation, which may help to explain either. (5) Providing decay resistance and stain to some cortex fraction may not always affect cells as a whole but often only part of the wall. (6) The question remains which kind of processes could possibly produce such enigmatic outcome.